King’s Day in Amsterdam is not an ordinary day in The Netherlands. 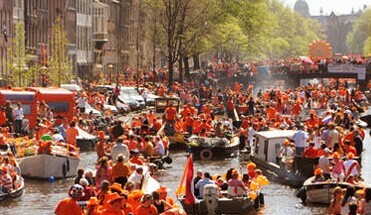 If you plan on visiting Amsterdam on the 27th of April, be prepared for parties and orange clothing! The city of Amsterdam will be filled with crowds of people enjoying music. In the early morning you can enjoy a second hand market at the Vondelpark. This is a very nice market where people from Amsterdam sell their stuff. Most of the stands will be hosted by parents and their children! This is a good way to start your King’s Day. But what will you do after that? Although Amsterdam is one of the best cities in The Netherlands to celebrate King’s Day. You can also plan to go somewhere else in the afternoon. You can visit other cities as well! So, what are the options? Be aware that not all public transport is available, please check this in advance. Amstelveen is a city close to Amsterdam. Amstelveen has a large shoppingcenter and in this area you have the opportunity to celebrate King’s Day! Their will be markets and bars open to have a good time. This city is also nice to celebrate King’s Night. The bars will be open untill late and you can mingle in with the locals. Muiden is a small and old town near Amsterdam. This is also the city that has the Amsterdam Castle! Of course this will be closed during King’s Day. Because this city is a lot smaller, this would be a nice day to wander around and look at the old buildings. Muiden is next to the Ijsselmeer, so you can enjoy nice views on the water. Want to stay really close to Amsterdam, but do you also want to check out another place? Then Diemen is for you the place to be. This is a small town. Normally a tram drives you from Amsterdam city center to Diemen. In the center of Diemen there will be music and also a market where people sell stuff. Be sure to book your hostel in advance, as it is very busy during King’s Day! When visiting Amsterdam, be sure to book a nice hostel for yourself. Hostel Amsterdam Orfeo offers you a comfortable place to stay at an affordable rate.